The Royal British Legion has accepted a donation from a member of the British National Party, after earlier this year seeking to distance itself from the party with a full-page advert in the national press. The donation illustrates a dilemma faced by a number of ex-servicemen's charities which have been approached by the BNP. The money was raised by a BNP member called Rachel Firth, who spent 24 hours on the street in a cardboard box to raise it. The problem was that she donated half of her funds to the BNP, and half to the Legion. The Legion says Rachel assured them the donation would not be exploited politically. But it was then splashed on the BNP website. Simon Darby, the BNP spokesman, denies exploiting the story. "It's funny how when we're involved, campaigning on an issue turns to cynically exploiting. But that's the spin we have to endure, said Mr Darby. "I don't mind being accused of cynically exploiting the issue as long as the issue gets some coverage." But this is also embarrassing for the Legion, which initially rejected the donation and then had a change of heart. 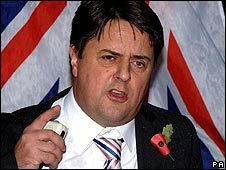 Furthermore, in June it posted a full-page advert in a national newspaper, accusing BNP leader Nick Griffin of politicising the poppy and asking him to stop wearing it. The Legion declined to make anyone available for interview about the donation. But it has said it will not return the money. The case illustrates a dilemma faced by other service charities approached by the BNP. Tommy Moffat runs FEBA, a charity which is negotiating £50,000 a year from the BNP to keep open its veterans' drop-in centre in Hamilton, Lanarkshire. 'We're at the bottom of the darkest pit, where we could close the doors within the next two to three weeks, and it would be a tragedy for our ex-service personnel. We're desperate," he says. Mr Moffat will discuss the matter further with Nick Griffin, next week. But he is clearly anxious about taking money from the party. "They're a legitimate party. We don't agree with a lot of what they say. But let me put it this way. It's either risking our reputation or risking that there are ex-servicemen wandering the streets wondering where help is coming from." The BNP is also offering support to Help for Heroes. Nick Griffin said last weekend the party was planning to auction two books signed by Andy McNab, the former SAS member, and donate the proceeds to the charity. ''Help for Heroes is a strictly non-political charity, we are only concerned with providing direct, practical support for our wounded servicemen and women,'' the charity said in a statement. Mr McNab has since said he does not want his books to be used by the BNP. Other charities feel donations by the party are simply inappropriate. Ron Smith, who is head of Veterans Scotland, an umbrella group for ex-servicemen's charities north of the border, said he did not think his members would welcome donations from the BNP as "many of our veterans fought in a major world war against a fascist regime". He added: "Look at the armed forces and you have multi-ethnicity. What would you do with BNP money - not spend it on soldiers of Afro-Caribbean descent? It's a complete nonsense. "We're very saddened they (other charities) feel they have to take this money, and they obviously have to clear their own consciences." Of course the BNP is a completely legal party with elected representatives. But its efforts to make donations to charities dealing with the welfare of former servicemen are clearly raising difficult questions.